A special edition bundle of the Nintendo 2DS is hitting Japanese shelves this February that pays homage to the original entries in the Pokemon franchise. To celebrate Pokemon’s 20th anniversary, the 2DS – coming in red, blue, green, and yellow – will be made available for the first time in Japan on February 27th. 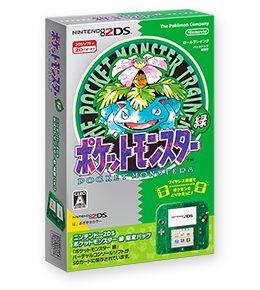 The system will include a digital copy of the respective coloured 2DS’ version of the original Pokemon. Nintendo announced the digital remakes would make their way to the 3DS eshop in last month’s Nintendo Direct, but chose not to reveal the 2DS bundles until now. Along with the game, the bundle will include a map of the games’ region, stickers, and a download code for legendary Pokemon Mew, which can be used in these games, Omega Ruby & Alpha Sapphire, or X & Y. The boxes themselves will be familiar to some, sporting the look of the original Japanese boxes for the first set of Pokemon Game Boy games, including Green Version, which never made its way out of Japan. There is currently no word on whether the special edition system will be made available for Westerners, though Japanese pre-orders are now available. The 2DS bundles are only one way that Nintendo plans to celebrate Pokemon’s 20th anniversary. Others, including the hotly anticipated mobile game, Pokemon GO, are set to arrive later in the year, making 2016 look like a pretty great time to be a Pokemon fan Pokemaniac. Right? Looks like it’d be such a cool thing to have in your collection years from now.